Finally, I have a pretty good idea of my blackwork sampler design. I feel good about how it is coming together. I had decided I wanted to do a sampler as my Blackwork Chessboard has been so much fun to stitch. Actually, I am almost done with it. I’ve got two white chessmen to stitch on the outside, then the black chessmen. A good, but gentle washing. Finish fringing. And it will be done! Jeff has decided to make a leather box for the chessmen he has picked from his collection. Then the chessboard will be rolled and set inside the box. I would recommend Carol Leather’s pattern wholeheartedly, even if you are not a chess player nor have one in your life. You could leave the chessmen off and have a simply lovely sampler of really cool blackwork motifs to inspire your own designs. So for my design. I have come up with a border I like. Why start with a border rather than the squares? I don’t know. Feels right. The border will help me set the tone for the squares it will surround. I don’t want to just develope squares I like and stick them together. I want to achieve a certain feel. The border has a certain airiness to it, reminding me of a wrought iron fence you might find outside a Victorian home. Neat. Clean. Geometrically lean, yet complex enough to hold moderately dense patterns. I will need to create squares that will blend to not give the piece a heavy look. The blackwork squares will be lacy and variably open while the needlepoint squares will be simple and linear. The top of the diagram (figure 1–click image for larger picture) represents one eight of the border. The 60 stitches to the right would be a mirror image of 1 through 60, left to right. Repeat three times for the other sides. Consequently, the piece will be 120 by 120. The three stitch inner border will be a needlepoint stitch, I’m thinking. The remaining internal area will be 92 by 92 stitches. I’m thinking a 4 x 4 grid with each block being 23. The middle 4 x 4 grid of squares will be divided by gold double running stitch. Or you can use whatever color will contrast nicely with your main colors, a solid for the blackwork and overdyed for the needlepoint squares. Whatever you use for the blackwork will be the proper thread for the outer border. The number of threads you use should be appropriate to whatever fabric you choose to use. Figure 2 is a close up of the center section of the top row. 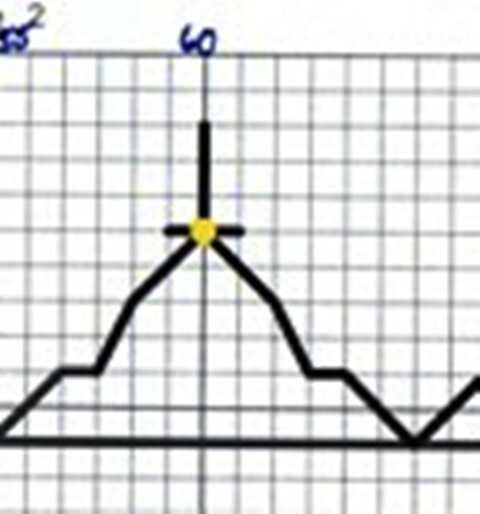 Note the yellow dot at the base of the partial cross. The represents placement of either a bead or a spangle. Your choice. The color should complement your colors, maybe the color you use to define the middle grid. You might be surprised, (I was) but to learn more about blackwork embroidery à la Katherine of Aragon I have been reading a lot about geometry. As noted earlier, Katherine’s world in Spain at the time was very much influenced by its Muslim past. For about 500 years before Katherine, the Iberian peninsula was ruled by a Muslim line that had escaped from Iran to Morocco in the 11th century. These people were influenced, as was all of the civilized world, by the Byzantine world, trade along the Silk Road, and the former culture of the Greeks. Mosaics, intricate goldwork, and divinely inspired architecture was the norm. Islamic people surrounded themselves with reminders of the divine. Geometry was critical to both building and ornamentation. With just a compass and a straight edge, Islamic creators have defined the universe. And it begins with a single point. A dot. Draw a straight line out from that dot and it becomes the embryo of one–the radius of a circle, or a simple straight stitch in the case of all embroidery. Using a compass and that radius, a circle becomes One. From any point along the circumfrence of the circle and using the same radius, you create another circle that intersects with the One. And then you have Two. As in Adam and Eve. Male and Female. The elements of Creation. Although blackwork, indeed Islamic ornamentation in general, that we all recognize as such appears very linear, in fact it is created from the intersections of many circles. The lines of the intersections may be flattened to create hexagons or triangles or squares. Lines may be removed to create larger space or emphasize certain areas of intersection. But it all starts with that seed of a dot extending into that line or that simple stitch. Perhaps that is why I love blackwork so much and have always been in awe of the works I have seen. Blackwork is divinely inspired. I feel it. And so does everyone else who loves the form. If you have a hard time visualizing this, I would recommend the book “ISLAMIC DESIGN A Genius For Geometry,” written by Daud Sutton and copyrighted in 2007. It is a tiny little book that you can put in your pocket to pull out and peruse whenever you have quiet moment. The drawings are lovely and very clearly demonstrate how the same circles can lead to sooooo many different final images. He also discusses that it is likely these Muslims did not understand the geometry perse, rather intended to describe their beliefs in a visual manner. Rather than using compass and straight edge in building, they would use tile patterns to lay out their designs, much as we use motifs to create our samplers or designs on fabric. That’s as far as I have gotten in this little treasure. But I am looking forward to devouring the rest of the material. In fact, from the drawing on the frontispiece, I have decided on the border for the sampler I am designing. I need to graph it. Then I will scan it into the computer so I can share it with you. It may seem odd to start with the border, but it feels right to me. You will be able to decide how big you will want your piece to be and stitch your border according. I am anticipating squares of 24 stitches down and across, but I’ll let you know when I post the border/corner design. 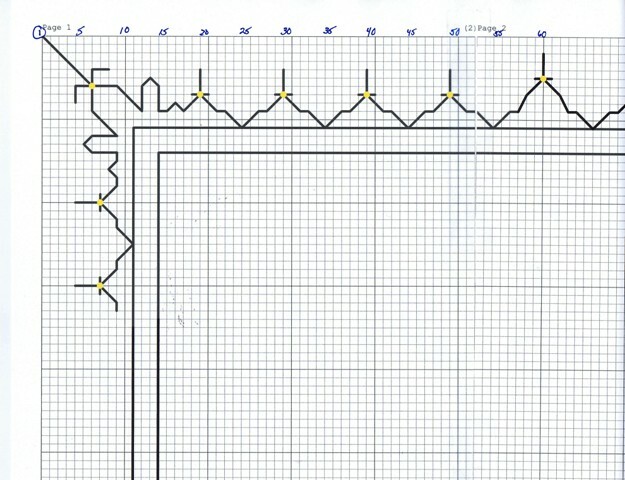 So you know, I am planning on alternating squares of blackwork with squares of needlepoint patterns. Personally, I will use black for the blackwork and use an overdyed charcoal thread for the needlepoint. I’ve picked out several overdyed already and will test them out as I go to see which looks best with the blackwork. I’m thinking of using black quilting thread or black silk for the blackwork. Not cotton. I want the finish of the thread to be smooth and and sharp to balance against the flowing of the overdye. And here you thought I’ve been doing nothing! A lot of creation spends a fair amount of time in one’s brain incubating. Math is not my strong suit. I spent more time passing notes during geometry than listening to the teacher. So, looking at this lovely artform from a mathematical perspective, as is proper in this case, is a challenge. Me seeking out math in pursuit of my art! Who would have thunk?! Luckily all of blackwork is not so strongly based in math. I will explore the two other forms of blackwork that are part of the whole body of the method in the future. But I want to finish exploring this linear form fully before proceeding–while my brain is primed for math!